Researchers should review their spam filters to see what malware is getting caught. Security professionals should be aware of current practices used by criminals pushing malware, even if it has little chance of infecting anyone in their organizations. Reviewing the spam filters keeps provides a clearer picture of our cyber-threat landscape. In today's trip through the spam filters, I found two emails with malicious attachments. These attachments are Word documents with malicious macros designed to infect a vulnerable Windows host with Gozi-ISFB. 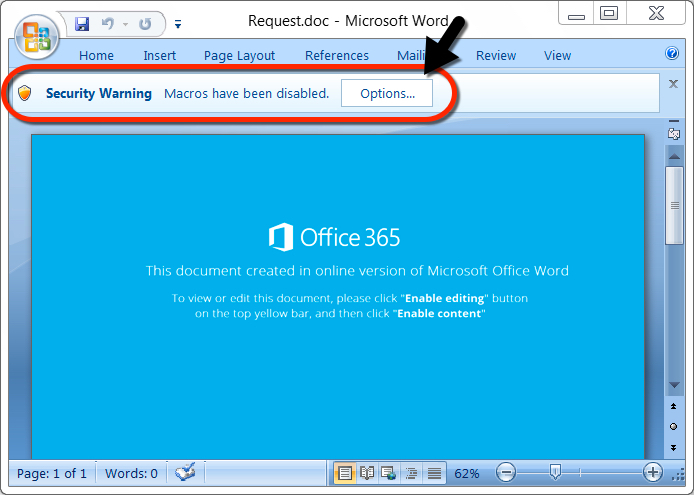 Shown above: Never a good sign when the document asks you to enable macros. Unfortunately, I cannot share the emails. Both emails appear to contain legitimate correspondence. They each include a chain of previous messages, and I could not easily redact the information like I normally do with other examples of malicious spam. Therefore, this diary will focus on the attachments, follow-up malware, and network traffic. 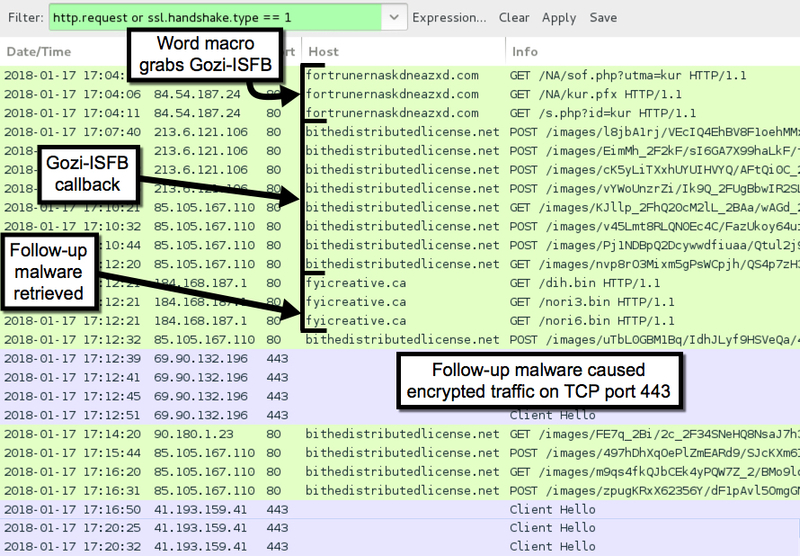 Gozi-ISFB is a variant of Ursnif, and today's traffic looked like an example shared by @DynamicAnalysis in a blog post on malwarebreakdown.com. 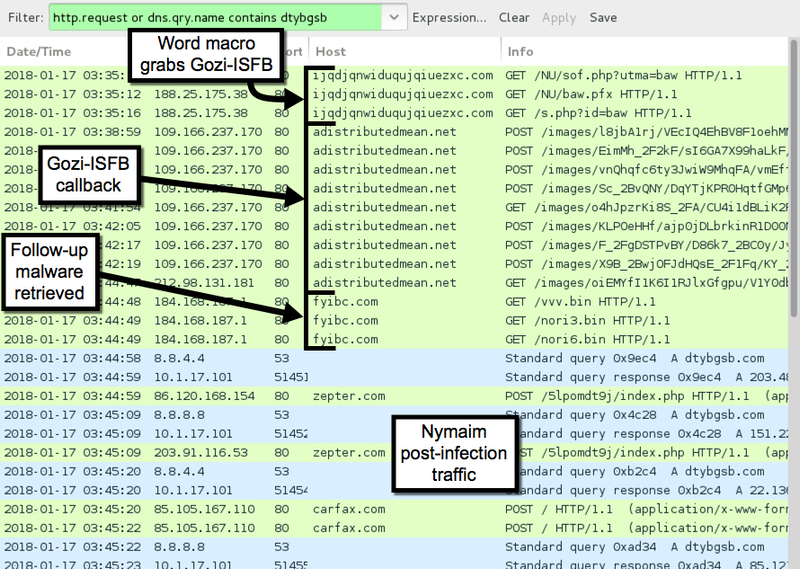 The first infection followed-up with the Nymaim Trojan, and I've documented Nymaim traffic back in November and December of 2017. Since I've covered Nymaim before, I'm far more insterested in the second infection where I couldn't identify the follow-up malware. The second infection follows the same patterns as the first. However, this time the follow-up malware is different. I saw encrypted traffic with no associated DNS requests or domains. Two of the IP addresses had interesting certificate data as shown in the images below. Shown above: One example of certificate data from the encrypted post-infection traffic. Shown above: Another example of certificate data from the encrypted post-infection traffic. Based on the network traffic and post-infection artifacts, I could not identify the follow-up malware. The follow-up malware is a malicious DLL named winmm.dll that's loaded by a legitimate Windows system file named presentationsettings.exe. Both were found in a newly-created directory under the infected user's AppData\Roaming folder. See the indicators section below for details. File description: Legitimate system file that loads any DLL named winmm.dll in the same directory. NOTE: carfax.com and zepter.com are legitimate domains and not compromised. They just resolve to bad IP addresses for dtybgsb.com due to the nature of this Nymaim infection. Of note, during the first infection, I rebooted the infected Windows host 3 or 4 times, which might account for multiple copies of what I assume are Nymaim. If you review the pcaps, the reboots are indicated any place you see an HTTP request to www.msftncsi.com. Pcaps and malware for today's diary can be found here. Good spam filtering, proper Windows administration, and best security practices will ensure most people never see this malware. However, criminals are constantly tweaking their methods in an attempt to slip past our defenses. It pays to be aware of current malware indicators, so we're prepared if any ever make it into our network. Unfortunately this sometimes can be tricky to update filters to block preemptively in some organizations do not want to miss out on mail especially false positives. Many times security researchers are subjected to only employing filters reactively and specific to the malspam. These filters generally are very specific and only come after the fact of discovery which usually means someone opened the email and attachment. In todays business landscape businesses need to stand strong with their security policies and do due diligence to ensure that if false positives are caught, they have a process in place to allow audit of these emails and releasing of them. All to often the reaction is to turn off the filters because the emails get held up and impacts sales. Unfortunately this happens at the cost of security. Just my 2 cents. So how did the malware get attached to legitimate emails? Quoting SasK: So how did the malware get attached to legitimate emails? That's a very good question. If they are in fact legitimate emails, this implies a host used by the other email account (or perhaps the email account itself) communicating the with recipient is compromised. It's possible an infected host is using a local cache of an email client to send these messages. Unfortunately, without having access to the host at the other end of the conversation, I don't know how this is being done. It's also possible these long email chains are completely fake, but what little I've seen indicates they are not. For example, signature blocks used by the recipient in previous correspondence from the email chain make me think these are legitimate conversations, and the host at the other end is somehow compromised. How this happened? I don't know.